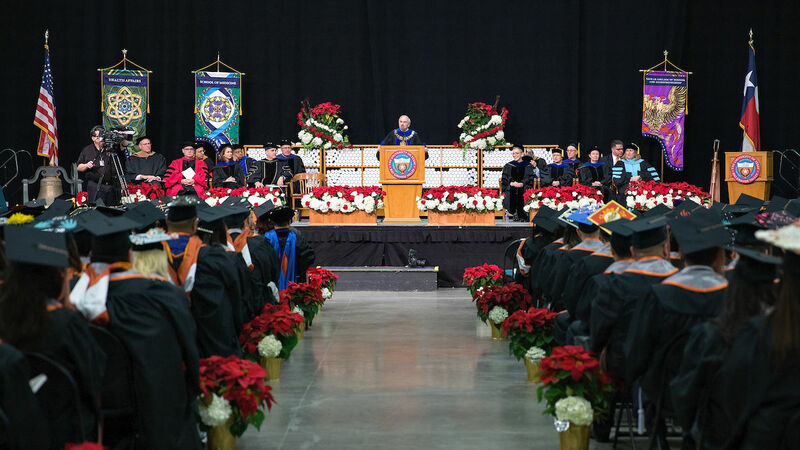 UTRGV Winter 9am Commencement for the Robert C. Vackar College of Business & Entrepreneurship and the College of Health Affairs on Saturday, Dec. 16, 2017 at the McAllen Convention Center. McALLEN — This holiday season is a little merrier for prospective graduates who participated in the second day of UTRGV’s Fall 2017 commencement ceremonies on Saturday. Held at the McAllen Convention Center, excited family members and loved ones packed the facility for four ceremonies, cheering on the prospective graduates from the UTRGV Edinburg Campus. UTRGV President Guy Bailey congratulated the Vaqueros on a milestone that will change the course of their lives and that of their families. He said he is awed by the talents and dedication that brought them all to this point in their lives, and asked them to remember to thank those who helped them along the way — faculty, family and friends. Fall graduation celebrations had kicked off Friday evening with about 600 prospective graduates from the UTRGV Brownsville Campus, who walked the stage at the McAllen Convention Center. Traditionally scheduled to be held outdoors on Friday evening on the Brownsville Campus Student Union Lawn, commencement for Brownsville-based students had to be moved to the indoor McAllen venue because of inclement weather forecasts for Friday evening. A total of 2,693 prospective graduates walked during all four ceremonies. Before concluding the joyful ceremonies, Dr. Patricia Alvarez McHatton, UTRGV interim provost and vice president for academic affairs, shared a few words of encouragement with the new university alumni. “Graduates, while you may think you reached the end of your journey, in reality, this is simply a layover as you explore new beginnings and consider what the next chapter in your life will be,” McHatton said.